These socks have earned the name "Humbling Socks" because they've certainly taken my sock design-and-making ego down several pegs. Not just the color thing, but the sudden failure of a familiar, much-used yarn up in the ribbing while I was working on the foot, and the discovery of several slack holes in the bottom of the second sock which I hope aren't more yarn failures. But they're done. Off the needles. 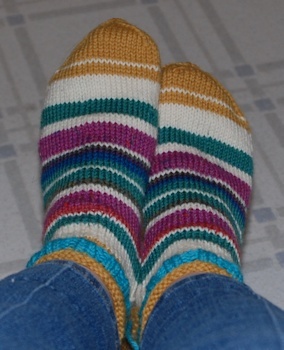 Here they are on my feet, before I had woven in any of the yarn tails. This is the first time I've made socks with completely matching stripes...and there are ten different yarns in these socks. 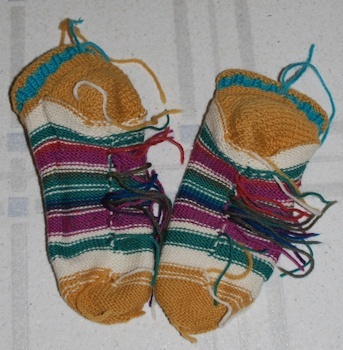 The old gold color (Bernat Sesame yarn about 50 years old) did last out the pair, but there's not much of it left. I wasn't sure it would be enough when I started the toe of the second sock. But there's enough for a (very) few stripes on future socks. (It's really more mustard color.) What's left of that yarn will be put in a sack with others of the same brand that have only a smidgen left. And fixing any weak spots I find, mostly along the bottom where I changed color or failed to "anchor" a join at the end of a row. Several pegs is fine. Always good to be a little humble. Of course, you still did a great job. They look wonderful. I'm sorry these didn't quite work out for you. But I have to say, I simply love them. I decided to wear them today. It was warm and humid and they felt good. The measure of a sock is how your feet and legs feel after a day in them, and these made the grade. It was a day with too much driving, too much sitting (in addition to the sitting driving), too much standing when not sitting in one place...my feet swelled some, but that was predictable and the socks cushioned me against impact on pavement. They look very pretty and comfortable. I wore them today. They are just as comfortable as the others I've made. And...the people who saw them said "How pretty." With Imposter Syndrome sitting on my head, I can say "Maybe they were only being nice," but the spontaneity of responses suggested...they actually liked them. And by the end of the day, I liked them better myself. (No one could see the places on the bottom where I'd made some fairly kludgy repairs to incipient holes.) Tomorrow I'll find out if all the dyes run and the white parts turn some other color, but tonight all is well. I may have to change their name from Humbling Socks to Attitude Adjustment Socks. Can you not weave the ends in as you knit? It's the way I was taght to do it and it does mean there is less weaving in at the end, only the ends from any sewing up on a garment. I could on one-row stripes, but not on the others, because I use the ends to protect the floats (think vertical floats, not horizontal ones as in Fair Isle...) To make best use of leftover yarns, I 'carry' yarn from one stripe to one farther on, twisting them in when I can, but once I have five or six going, that becomes difficult. So any float as long as a fingernail gets an end woven back and forth across it, to protect it, and that needs to be done after I turn the sock inside out at the end. Then there are the solo stripes, where I don't carry (and add two tails) and the situations where it's a long way to the next stripe of that color and I'm juggling five or six balls of yarn--so I cut rather than carry. Besides, I think it's kind of fun to see the "mane" spread out. Now if it's only a two-color stripe, it's no problem to twist the yarn or knit a stitch with both yarns every other row or so. This one had the most yarns I've ever used on one sock. Failures or not, I really like them. Your socks are always gorgeous. They make me want to take up sock-making. 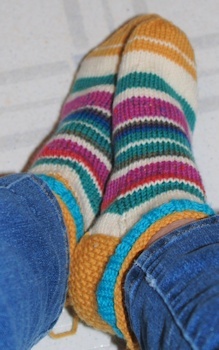 I haven't done so yet, but I did get around to finding a pattern for crocheting socks. One day when I'm not feeling like I have too many other things to do, I'll see what kind of results I get.